Hey friends! Pam here! 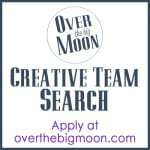 I am excited to announce that we are going to be adding a Creative Team here on Over the Big Moon! This is something that I have really put a lot of thought into and I want to do it right! I know there are so many talented bloggers out there that can add to the value of Over the Big Moon! I will be working closely with our Creative Team to make sure that my stamp of approval goes on all posts and really fits on Over the Big Moon!! Are you a blogger and interested in being a part of our Creative Team? – Someone who is fun, creative, has new ideas, meets deadlines, organized and wants to be a part of a team! – Rockin’ photography! Although great ideas are important, you’ve gotta be able to make that idea appeal to our readers! – Each month, you’ll submit 3 post ideas and I will choose the idea that fits best for Over the Big Moon. – Great photography! This is SUPER important! I don’t require it, but I do love to see you share your idea on your social media channels as well!! – PAY! You will get $25 per post, paid if your post is completed by its due date! 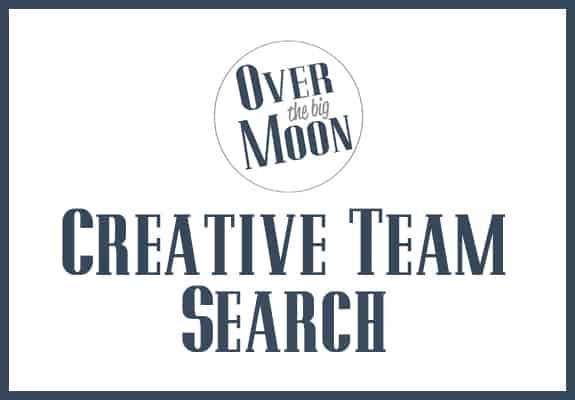 – Access to Over the Big Moon’s Creative Team Board on Pinterest! – Your post shared on all OTBM social media channels! – 5 Pins pinned monthly onto 2 of our top group boards! – Access to an OTBM Creative Team FB group where we can share ideas, opportunities, you can ask questions, etc! – Quarterly thank-you gift via snail mail! – Your Bio at the bottom of each of your posts! – Your Bio and social media channels listed on our Creative Team Page! Complete the form below (or click HERE)! If for some reason you have trouble with the form, feel free to email me at pam (at) overthebigmoon (dot) com! The deadline for applications is August 17, 2015. Thanks for taking the time to apply! I can’t wait to get to know you!